The next work we need to do on our Bofors 40mm AA gun is to replace or re-temper the balance springs (which the USA call the equilibriator springs). Problem is, we dont have any technical information about the springs. Apart from the spring dimensions, we dont know the spring 'poundage' or 'spring rate' to get them retempered to. 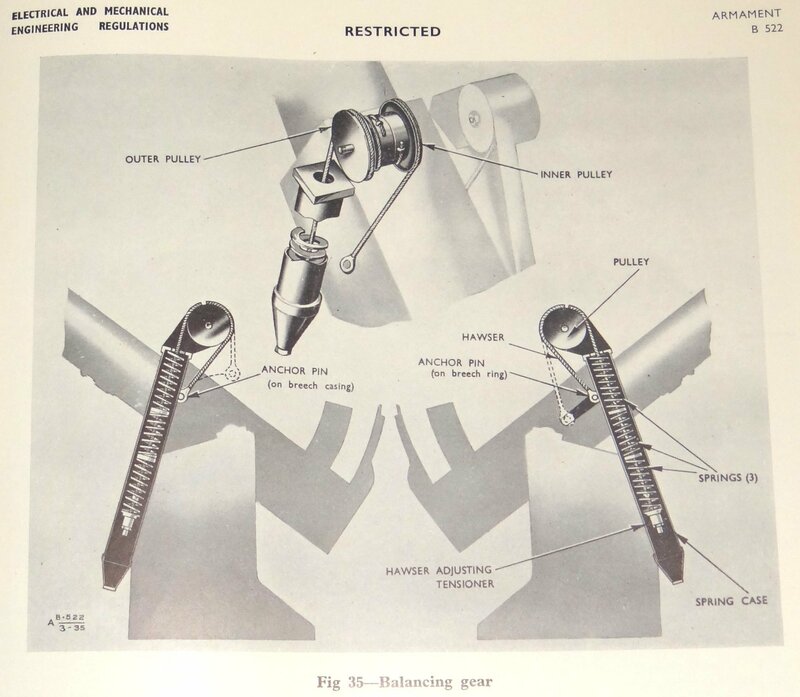 All of the publications that I can find so far that mention the springs are for field servicing... the springs might be replaced but they are not re-made, so the technical info is not included. Anyone know of a source of technical / engineering info that would include the information we need ? Anyone know of a source of technical / engineering info that would include the information we need ? Thanks for the suggestion, but unfortunately I've already tested that particular well and it's dry... they have the 1941 handbook (which we have a reprint of already) and it doesnt have the technical detail that we need. I wondered if there were any clues about the performance of the springs in EMER ARMAMENT B 528 although this is the Technical Handbook - Inspection Standard, it is only a Unit Inspection Standard & I can find nothing there to help you I'm afraid. I don't have it, but more details of performance may be found in EMER ARMAMENT A 521/33 Examination of Ordnance, Examination Data for Specific Equipments. I have B 522-254, I'll try & find them & have a look. I know nothing about armaments so could you explain where the springs are located & what they do, this will help me narrow down the areas I should be looking for. 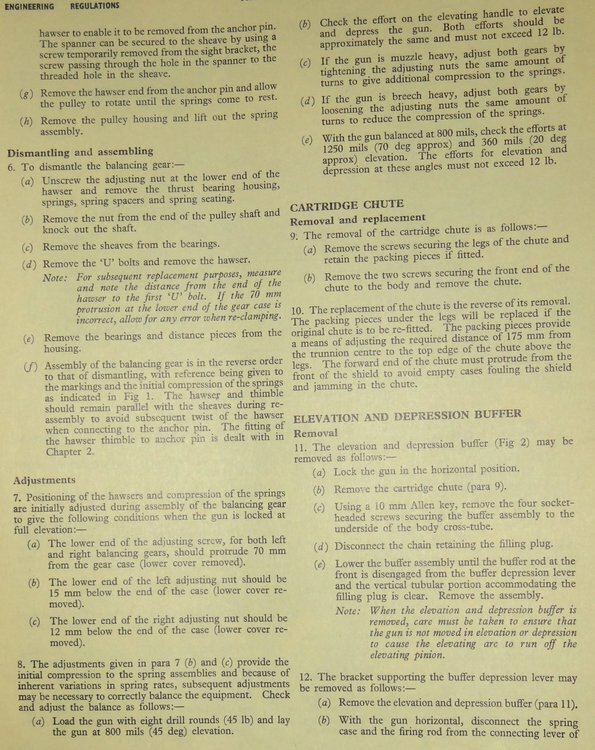 Have you taken the springs and/or explained what you require to a spring maker?. If, you search "spring calculator" most of the sites that come have a Spring Rate Formula. Bit of coverage in the Technical Description. There is also some advice in Unit Repairs, I'll do those when the battery on my camera has charged up again. For info, "equilibrator" is apparently a valid British term too. The FV433 Abbot has air over hydraulic equilibrator rams. many thanks again everyone... I didnt expect such a rapid and detailed reply. I'm being dragged off to do 'normal' things for a day or so by SWMBO, but I'll look at all the contributions carefully as soon as I can. I wondered if there were any clues about the performance of the springs in EMER ARMAMENT B 528﻿ although this is the Technical Handbook - Inspection Standard, it is only a Unit Inspection Standard & I can find nothing there to help you I'm afraid. Many thanks for this and your other posts. One thing... 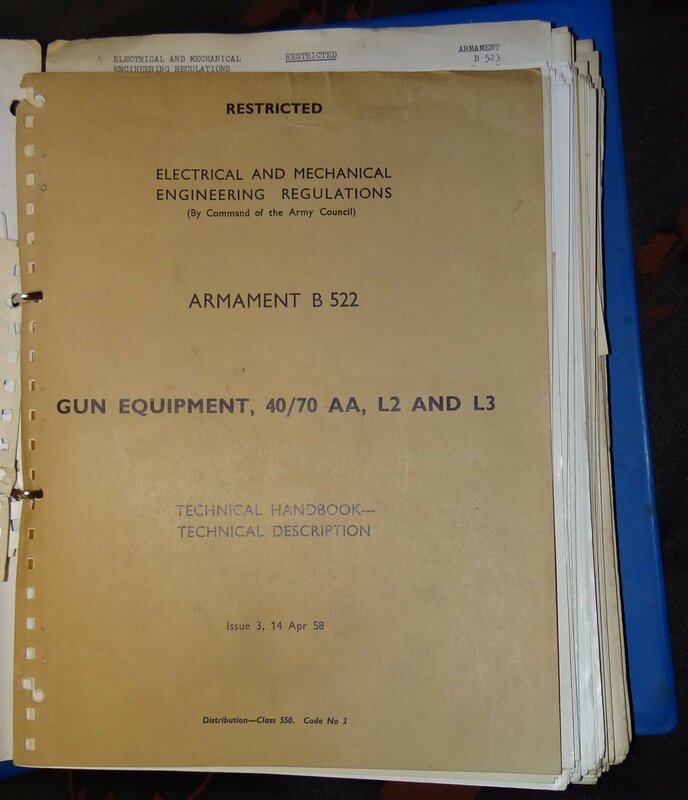 I'm not familiar with the EMER ARMAMENT or these B numbers... can you give me some background please as to what it all refers to and where the documents can be found ? Also, I've been looking at the pictures you kindly posted... unfortunately these seem to be for a different gun as there are some significant differences from the gun we maintain. 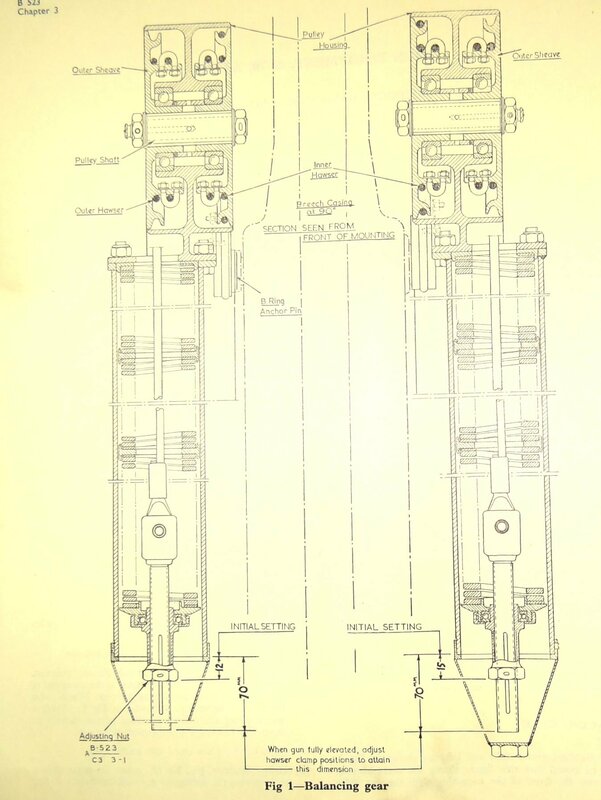 We have the 40mm Bofors... is it possible the diagrams are for an earlier 25mm Bofors ? There are large collections of EMERs on all subjects held by the REME Museum. I'm not into guns so sorry I may have got the wrong weapon, what is the exact military nomenclature of the gun? I've not got very far with the SAAB references unfortunately... we have tried contacting BAe but that just goes into a black hole. We've scheduled to take the springs out tomorrow (15 Jan) and thesewill go to a spring maker to repair or remake. Thanks Clive... so far I've not thought of contacting the REME museum so that can be my next stop. As far as I now, 'our' gun is a Bofors 40mm Anti-Aircraft gun, sometimes with the term L/60 or L/70 added (this refers to the length of the barrel). So I don't know what you make of L2 & L3 in this instance? I think here L (meaning Land service) is the later incarnation of Mk. Clives literature covers the post war L70 series of guns. Your gun is the original Bofors L60 design. Even the early British built L60 is different to the original Swedish design, particularly in the carriage but also the ordnance, it being simplified for easier manufacture. I admit I've not encountered 'L' designations before, as you say it's probably an alternative to MK numbers If it says anything about Balance springs at all I'll be happy to have that info (on the basis that anything is an advance on what we know at present). That's noted thanks.... all I can hope is that the balance springs did not alter too much over time. If it says anything about Balance springs at all I'll be happy to have that info (on the basis that anything is an advance on what we know at present). There are some references to springs in the pages I've posted that may have similarities of function to yours. The details you require will probably only be found on the original spring drawing. As the 40mm wax made at ROF Nottingham, both L60 and L70 versions, but whether the mounts were the sme I dont know. You might try to contact the ROF Heritge centre at BAE SYSTEMS Glascoed. When the various ROF sites were closed information was passed on to them. However I must admit it is a fairly long shot. The following may help you understand how these work in principle. With the actual springs, and knowledge of the dimensions and weights of the system, you can probably work out the relevant information. The details you require will probably only be found on the original spring drawing. As the 40mm wax made at ROF Nottingham, both L60 and L70 versions, but whether the mounts were the sme I dont know. You might try to contact the ROF Heritge centre﻿ at BAE SYSTEMS Glascoed. When the various ROF sites were closed information was passed on to them. However I must admit it is a fairly long shot. Thanks, I'll give ROF Heritage a try.